This video has some great ideas for places to see and visit in Arizona. Of course the Grand Canyon is #1 on the list, but what else is there for you to discover? Finding wallet-friendly activities around Phoenix doesn’t have to be a challenge. No matter if you enjoy the great outdoors or great art, there is something for everyone – free of charge. 1. Get a Culture Pass – This pass gives Phoenix Public Library customers FREE admission for two people to an arts or cultural institution. There are a limited number of passes available, but you can pick one up at any of the 17 library locations. You have seven days to use the culture pass before it expires. Check out a Culture Pass at the South Mountain Community Library and enjoy the building too. It’s made from 76,000 pounds of copper, 665,000 tons of steel and glass. 2. Phoenix Art Museum – Enjoy international exhibitions, amazing photography and more than 17,000 works of art. Admission is free on Wednesdays from 3 – 9 pm and on the First Fridays from 6 – 10 pm. 3. Continue the first Friday fun with Artlink Phoenix. Several art galleries, venues and spaces offer free admission between 6 pm and 10 pm. You can sign up for the Artlink’s newsletter so you can know about the different exhibitions and activities that will be going on each month. 4. Cosanti, in nearby Paradise Valley, is home to the Paolo Soleri Windbells. You can visit the gallery, Monday through Saturday from 9 am to 5 pm and from 11 am to 5 pm, Sunday. The gallery also features sculptures, graphics and sketches. 5. A night of cinematic entertainment may be more up your alley. Each spring, the Movies in the Park series begins. Classic movies are shown in their original formats. You get to sit back and enjoy the free shows under the stars on the lawn. Check the Biltmore Fashion Park event list for dates and times. 6. The North Mountain Visitor Center opens the doors to visitors for free admission on the first and third Saturday of each month (from October to May). Starbucks coffee is available at the front desk and there are home-baked goods available for purchase (with proceeds going to support the NMVC). Admission to the center is always free, but the Coffee House Saturdays are a nice bonus. 7. The Arizona Science Center offers an Adults’ Night Out on the first Friday of each month (from 5:30 pm to 9:00 pm) – only those 18 and over are allowed to enter. It’s the perfect time for adults to enjoy the four floors of hands-on science fun. The Center also rolls out the cash bar and invites in local DJs to make it a night to remember. 9. McDowell Mountain Regional Park offers a wide variety of outdoor fun. You can enjoy the views, keep an eye out for wildlife (including deer, javelina, and coyotes) or test your endurance along the 50 miles of multiuse trails. One of the best things about Phoenix is that there is always something to do, whatever it is you enjoy doing. It only makes things better (and lighter on the wallet) that you can find plenty of interesting and exciting free things to do in Phoenix. The normal image of Arizona for many people will be the desert, majestic rock formations and probably heat. Arizona holds many unusual and unexpected sights and sounds when you begin looking beyond the ordinary and expected. 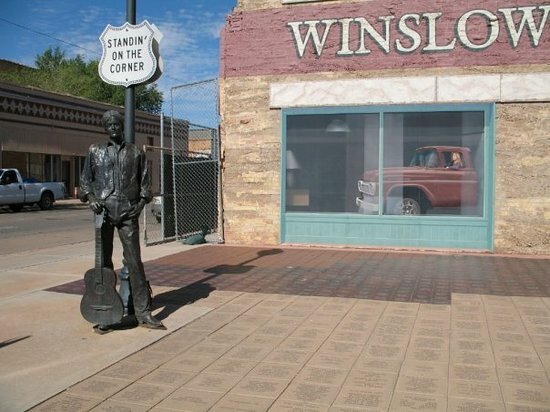 1) Eagles fans will appreciate the “Standing on the Corner Park” in Winslow, Arizona. Here you will find a life-size bronze statue of a guitar player, and a trompe-l’oeil mural showing the reflection of the flatbed Ford in a store window. Winslow had been one of the largest cities in Arizona until Route 66 was no longer the main thoroughfare. A local foundation created the corner park to bring traffic back through Winslow. 2) London Bridge is NOT where you might expect. In 1968, the City of London sold the famous bridge to an American. Today, the 950 foot bridge spans a manmade canal that cut through a peninsula on Lake Havasu. Come for the bridge but stay for the boating, beaches and other outdoor activities available around the area. 3) They yabba, dabba do have dinosaurs in Arizona. At least 15 species of dinosaurs once roamed Arizona and left tracks across the state (most famously the Moenkopi Tracks outside of Tuba City). But forget stuffy museums and geological tours. Go for the kitsch. 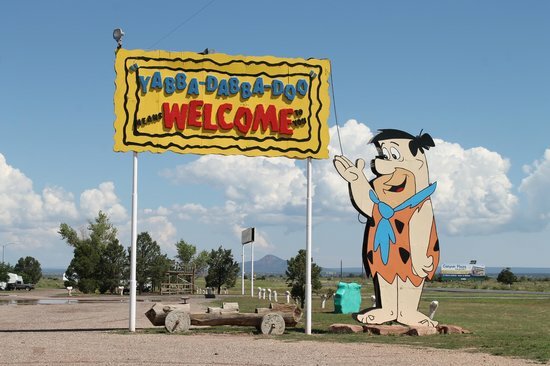 Take $5 and visit the Flintstones Bedrock City in Williams, Az. At this old-style park, you can slide down a brontosaurus and ride in a Flintstone mobile tram. Over in Holbrook, Arizona, seven dinosaur statues (ranging from just a few feet up to 25 feet in height) sit in front of the Rainbow Rock Shop, and just south of town, eight more of the creatures stalk Jim Gray’s Petrified Wood Company. 4) Travelers across the southwest are familiar with the occasional cow lumbering across the road, but in Oatman, AZ, wild burros roam the streets and interact with tourists. The burros are descendants of the beasts of burden used by the gold miners who once worked the area. Oatman is on old Route 66, just southeast of Laughlin, NV. As well as being famous for their burros, the burg is home to old West gun fights, January bed races, and the annual 4th of July Solar Egg Frying Contest. 5) Tucson, Arizona offers a graveyard of a different kind. The “Boneyard” or the Aerospace Maintenance and Regeneration Group (AMARG) is home to thousands of aircraft from throughout the years. The facility houses more than 4,400 aircraft and 13 aerospace vehicles from the all U.S. military branches, and several federal agencies including NASA. It is part of the Davis-Monthan Air Force Base, so to get close to the planes; you will want to take the Prima Air and Space Museum bus tour (the bus will not stop but you will get a closer view of all the planes). Some of the boneyard aircraft get a new life in the project, Round Trip: Art From The Bone Yard Project. The project takes planes and puts them in the hands of contemporary artists who re-image elements of the aircraft as works of art. You can see works from the exhibit around the museum grounds. The limits of what you can find in Arizona seem only to be your imagination.